This black wide joint floor grout for 3mm-20mm joints not only helps to provide a secure and protective tiled floor but also works as part of the overall design. You can complement it with black tiles to give the impression of a slab-like floor. Alternatively, use it with light coloured tiles for a trendy contrast. Black is a timeless colour and mixes with the vast majority of shades. Premium quality one part flexible grout is easy to apply and suitable for grouting a variety of floor tiles including; Porcelain, Marble, Travertine, Limestone, Quartz, Ceramic, Granite and Slate. Our grout is waterproof making it perfect for shower areas and swimming pools. It is also compatible with underfloor heating. 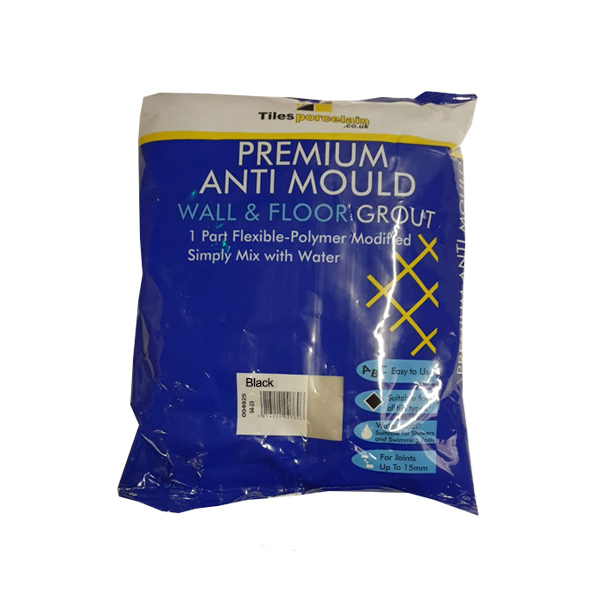 Wide Joint Floor Grout can be used in both internal and external areas. Ensure the tiles are firmly fixed and the joints are clean before grouting. Firstly, add the grout powder to cold clean tap water and mix into a smooth, slightly stiff consistency, which can be done by hand or with a mechanical mixing paddle. Mix only a sufficient amount which can be used within one hour. Work the grout into the joints to make sure they are completely filled. Make sure you clean surplus grout from the tiles and joints as soon as possible as set grout will prove difficult to remove later. Allow 24 hours before walking on the surface. If you have installed an underfloor heating system it is recommended that you do not apply heat until two days after grouting your tiles.